Since 1995, the Sustainable Development Association has worked with students, citizens and First Nations to support community initiatives to map ecology and indigenous heritage (community baseline and sovereignty). Our use of Geographic Information System GIS mapping software (ESRI Arc-Info, Arc-View etc) organised by students from McGill University's School of Urban Planning and Department of Geography as well as other departments and students from universities worldwide. In 1996, Eco-Montreal Tiohtiake Green Map www.eco-montreal.mcgill.ca started out by joining with Wendy Brawer founder of the Green Apple Map of New York City and a similar initiative in San Francisco in developing our city's contribution to the Green Map System www.greenmap.org under Wendy's leadership. We continue with many local mapping projects in Notre Dame de Grace for local community and green organisations with the NDG Community Council 1998 a transportation mapping of Old Montreal 1999, Mapping of Ecological Farms and Sites in Vaudreuil-Soulanges region west of Montreal island 2000, green mapping of Iles de Boucherville 2001, mapping of an elementary schoolyard 2002. In 1999 - 2001 we supported the Kahnawake Kanien'kehaka Onkwawena Raotitionkwa Cultural Center under the direction of Melvin Tekahonwen:sere Diabo and Raymond Kanatase Gabriel from Kanehsatake in the Geographic Information System mapping of Mohawk Placenames and Heritage in Tiohtiake, the greater Montreal region. We have placed it on http://cbed.geog.mcgill.ca/WIP.html referred to by Tekahonwen:sere as Tsi Tetsionitiotiakon, with our added commentary Sustainability Rooted in Heritage. Durabilité enracinée dans notre héritage est un traduction du text. 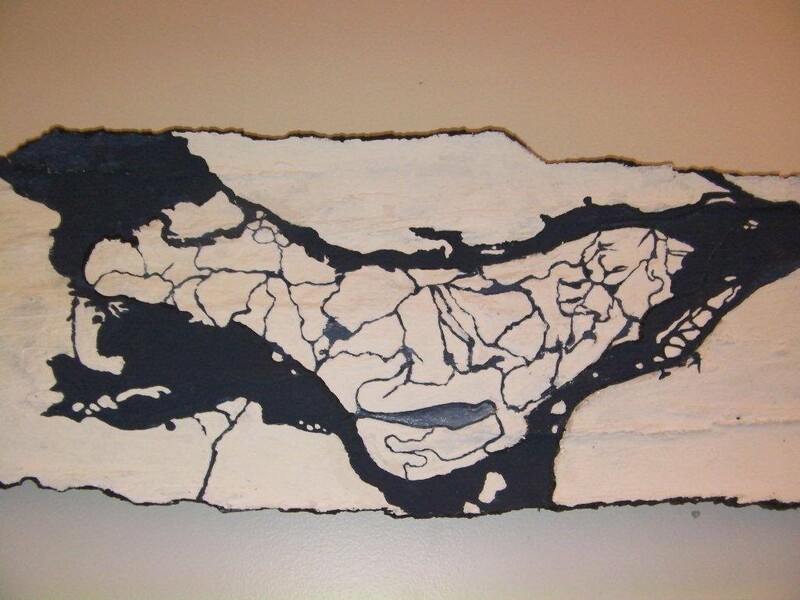 BARK MAP ON POPLAR In the indigenous tradition of bark-surface mapping, Alain Lebel, Master Sculptor has drawn the 1542 to 1642 Tsi Tetsionitiotiakon (Montreal island) watershed map with 45 canoe-passable rivers and 10 lakes as left from the Mohawk - Wendat period till most of the productive oak, butternut, cherry, peach and other food trees had been cut for agriculture thus loosing the water conservation properties of these root systems and photosynthesis arboreal agents. These maps bring out the richness of the water-shed ecology. Alain in artistic rendering has joined the rivers into continuous networks, which would not necessarily have been the case but inspiring none-the-less. These maps are part of artistic rendering of various aspects of Mohawk and First Nation heritage as generating accessible easy to understand materials for public education at all levels. The 1542 - 1642 map below illustrates 45 Rivers and 10 lakes on the island of Montreal. These rivers were canoe passable rivers fed by many thousands of creeks and rivulets. Water flows were determined by First Nation (Mohawk, Wendat, Algonquin) practices of Agro-forestry whereby the principle sources of food were three-dimensional such as the acorn of the Oak, butternut, hazelnut, cherry, peach and hundreds of other specialised nut, fruit and green (edible) trees, vines, bushes and other levels of tree-led food production. These 3-D living environments held massive quantities of water within plants, roots and related biosphere, creating constant equilibriation such humidifying the air as well as condensing excess humidity onto leaf surfaces for absorption. These living biospheres absorb 92 - 98% of solar energy and convert this through photosynthesis into plant matter and produce. The root systems descend as deep as the canopies to pump water, minerals and develop nutrient colonies many tens of metres into the substrate. The coolness of the biosphere attracts warm moisture laden ocean airs to each region subsequently absorbing and releasing moisture across the continent. United Nation (UNESCO) estimate productivity of Agro-forestry systems to be 100 times (10,000%) more productive than 2-D 'agriculture' (Latin 'ager' = 'field'). When Europeans arrived as colonists they had forgotten their own Celtic tree based food production origins. Not understanding the complexity of production and the diversity of produce, Europeans named these lands 'wilderness' before destroying them. With feudal allegiances, they cut productive trees, shipping these to Europe for fortifications, Cathedral building and other excesses. The exposed fields no longer held rain and snow water causing the rivers to flood in the spring and dry in the fall, in effect loosing the abundance they held under First Nation governance. As fields failed, every windmill across Quebec failed to meet production requirements for sustainable outputs putting many into bankruptcy. Hence the colonist packed up again and moved further west repeating this pattern untill no indigenous orchard lands remain. Those who remained filled in the now mostly dry lakes and culverted the rivers into sewer and storm drains. Without local food production, the colonist turns to import of produce from third world countries afar again in a form of unequal foreign plunder. Please refer to a detailed discussion attached under section B. ECOLOGICAL DESIGN, 1) INDIGENOUS WELCOME & ORCHARD FOOD PRODUCTION EFFICIENCIES. The highway and boulevard overlays are provided as well known landmarks of today to help viewers locate the rivers. GREEN MAP SYSTEM www.greenmap.org 1989 Started by Wendy Brawer as The Green Apple Map presented at the Rio-de-janeiro Earth Summit, then expanded in 1996 with Eco-Montreal Tiohtiake Green Map (GIS) and San-Francisco Green Map (GIS). In 2010 there are over 500 community initiated Green maps on every continent of the world a national, state, provincial, city, neighbourhood, school, regional and other levels. Begun in 1996 as a Geographic Information System GIS mapping with many layers of information developed over decades. We welcome all collaboration among community organisations, governments at all levels, institutions and businesses. Eco-Montreal:Tiotiake is a collaboration between the Sustainable Development Association, the McGill University School of Urban Planning, and countless organizations and volunteersEco-Montreal presents a fresh perspective on Montreal's relationship with its natural environment. This perspective gives visibility to the natural world and to how the city integrates it. Such a vision transcends politics and traditional planning. Ultimately this kind of mapping be of great value and serve as a tool for planning and environmental resource management. Éco-Montréal: Tiotiake est un projet conjoint de l'Association du Développement Durable, de l'école School of Urban Planning de l'Université McGill, ainsi que de plusieurs associations et de nombreux volontaires. Éco-Montréal présente une nouvelle perspective sur le rapport qu'entretient Montréal avec son environnement naturel. Cette perspective donne une visibilité au monde naturel et à la façon dont la ville s'y intègre. Cette vision doit se distinguer de la politique et de la planification traditionnelle. Ultimement, ce type de cartographie peut servir d'outil pour la planification et la gestion des ressources environnementales. Le sous-titre Tiotiake, prononcé djo-dja-guay, est d'origine Mohawk et a été choisi en hommage au respect que les peuples indigènes ont envers la région de Montréal. Tiotiake désigne l'archipel (groupe d'îles) de Montréal et signifie là où les rivières et, par allégorie, les peuples s'unissent et se divisent. Or, un titre basé sur des éléments naturels et non sur des frontières administratives et qui, dans un esprit de biorégionalisme, semble plus approprié.